Barcelona was one of the cities of choice for exiled Irish political and military leaders in the 17th and 18th centuries. But even before the ‘Wild Geese’ fled in large numbers to Spain and France after the defeat of the Jacobite forces and the Treaty of Limerick in 1691, prominent Irish exiles found refuge in Barcelona. Gerald FitzGerald, the 16th and last Earl of Desmond, forfeited the largest estate any individual in Ireland ever possessed. He and his wife Eleanor Butler, daughter of Edmund Butler, Lord Dunboyne, were the parents of one son and two daughters. However, when their only son, James, died in the Tower of London in 1601, the representation of this branch of the FitzGerald family passed to his nephew, John FitzGerald, who married the daughter of Richard Comerford, of Danganmore Castle, Co Kilkenny. He went into exile in Spain in 1603. Although he was de jure the 17th Earl of Desmond, he never used the title, and instead he was known in Spain as the Conde de Desmond. John and his Comerford wife were still living in in Barcelona in 1615, and they had an only son Gerald before he died in Barcelona. However, this son, Gerald FitzGerald, Conde de Desmond, felt the small pension he received from the King of Spain did not reflect or honour his dignity and rank as the heir of Desmond. He left Spain abruptly, joined the German imperial army and died of starvation during a military siege in 1632. Gerald had no children, and with him the direct male line of the Desmond FitzGeralds came to an end. The decline of this branch of the FitzGeralds of Desmond and their kinship with the Comerford family came to mind while I was in Barcelona last weekend [25-28 March 2016]. I was also aware of the story of John Comerford, an Irish general who moved to Barcelona with the ‘Wild Geese.’ But as I explored his story I also came across the extraordinary story of his grand-daughter, Josefina de Comerford, who became involved in Spanish political intrigues in the early 19th century. She was given the title of Condesa de Sales and has become the subject of Spanish biographical studies – even before her death she inspired romantic semi-fictional biographies. To this day, her legacy has divided Spanish historians, who have seen her as a fanatic, an extremist, a romantic heroine, a femme fatale or an early feminist. On 1 November 1709, King Philip V of Spain decided to collect all the Irish units into one brigade. The regiments included the Ultonia or Ulster Regiment under the command of Dermot MacAuliffe, who had fought against the Williamite forces at the siege of Cork, the Hibernia Regiment, commanded by Lord Castlebar, the Irlanda Regiment, commanded by John Wauchope, the Limerick Regiment, commanded by the Louis Joseph de Bourbon, Duc de Vendome (1654-1712), and the Waterford Regiment commanded by Colonel John Comerford, also known as Don John de Comerford. During the Wars of Spanish Succession, the new Irish Brigade fought at the Battle of Saragossa, the Siege of Barcelona (1710), the capture of Palma, in Majorca (1711), and in the Spanish attack on Sicily (1718). John Comerford (ca 1665-1725), was born in Finlough in Loghkeen, Co Tipperary, and was a member of one of the Callan branches of the Comerford family in Co Kilkenny. He was sworn a freeman of the City of Waterford on 23 August 1686, and during the Jacobite Wars he was an ensign in the Jacobite Bagnall’s Regiment of Foot alongside his brother Henry. By 1709, he was the colonel of the Regiment de Waterford in the Spanish army. Later, he was promoted to the rank of Major-General and knighted by the King of Spain. He died in Badajoz on 18 May 1725. His widow, Henrietta O’Neill, died in Madrid in 1747. Her first husband was another Irish exile in Spain, Colonel Henry O’Beirne, an Irish colonel in the Spanish army. Henrietta Comerford was a daughter of Henry O’Neill of Eden, Co Antrim, and his wife, Sarah O’Neill, of Shane’s Castle. Henrietta Comerford’s brother, John O’Neill, was the father-in-law of Richard Butler, 7th Viscount Mountgarret, and was the grandfather of Lord O’Neill, who was killed at the Battle of Antrim in 1798. Henrietta Comerford and her first husband were the parents of Maria Therese O’Beirne (died 1777), Maid of Honour to the Queen of Spain. In 1726, she married the attainted Philip Wharton (1698-1731), 2nd Duke of Wharton, Marquess of Catherlough, Earl of Rathfarnham and Baron Trim. The Duke of Wharton inherited Rathfarnham Castle, Knocklyon Castle and other estates in south Co Dublin through his mother, Lucy Loftus of Fethard-on-Sea, Co Wexford. Three years before he married John Comerford’s step-daughter, Wharton sold these estates in 1723 to Sir William Conolly, Speaker of the Irish House of Commons, for £62,000. 1, Joseph John Comerford (1719-post 1777), also known as ‘Don Joseph de Comerford’. 2, Elinor, who also married into the O’Beirne family. She was living with her half-sister, the Duchess of Wharton, at her house in Golden Square, London, when she died in 1777. She was the mother of three daughters. 3, Frances (Doña Francisca) Magdalene. 4, Dorothea, who appears to have been dead by 1777, when her half-sister, the Duchess of Wharton, died in London. Joseph John Comerford (1719-post 1777), also known as ‘Don Joseph de Comerford’. He was born in 1719 in Barcelona. He was a Knight of the Order of Calatranta, and was living in 1744. He married Maria Magdalena de Sales, Madame de Sales, a widow sometimes described as Marquesa de Sales. Doña Maria Magdalena de Sales, Marquesa de Sales, was a native of Annecy in the Duchy of Savoy, and a member of the same family as Saint Francis de Sales, Bishop of Geneva. Don Joseph de Comerford was still living in 1777 when his half-sister, the Duchess of Wharton, died in London. ● 1 (Major) Francisco Comerford (ca 1749?-1808). (Major) Francisco Comerford (ca 1749?-1808). He was a godfather or sponsor at the baptism of Carlos O’Donnell y Anethan, father of Leopoldo O’Donnell y Jorris (1809-1867), the first Duke of Tetuan, and Spanish Minister of War, and grandfather of Carlos O’Donnell y Alvarez de Abreu (1834-1903), the second Duke of Tetuan and Spanish Foreign Minister. Francisco Comerford proved the will of his aunt, the Duchess of Wharton, in 1777. He was a major in his grandfather’s Regiment of Ireland. He was stationed in Tarifa, next to Gibraltar, with his regiment, and in 1805 he was an eyewitness of the Battle of Trafalgar. 1, (Doña) Josefa Eugenia Maria Francisca Comerford MacCrohon de Sales (‘Josefina’ de Comerford) (1794-1865). His younger brother was Enrique Comerfort, Conde de Bryas. He wife was Juana Francisca de Comerford y Sales. Following the French invasion of Spain, he resigned his army commission and left for Dublin, bringing his 11-year-old orphaned niece and god-daughter Josefina with him. Later, he attended the Congress of Vienna in 1815 and died soon after. His niece, Doña Josefa Eugenia Maria Francisca Comerford MacCrohon de Sales (1794-1865), is known in Spanish history and in popular folklore as Josefina de Comerford. She was born in 1794 in Ceuta, a Spanish outpost in North Africa, and she was baptised on 26 December 1794 in the Church of Nuestra Señora de los Remedios in Ceuta. Her father soon moved to Tarifa, because he preferred that city to Ceuta, which was a prison colony. When her parents died, she was adopted as an 11-year-old by her uncle Enrique Comerford, Conde de Bryas, and she moved with him to Dublin, where she appears to have been brought up in luxury and in a wide social circle. She was in Vienna with her uncle when he attended the Congress of Vienna in 1815. Enrique Comerford died soon after, and she then moved to Rome at the suggestion of her Irish and Spanish family and friends. It is said she rode into battle with her whip in one hand and a crucifix in the other, burning villages by day and praying the rosary at night. She led her followers to believe they had the support of the Holy See, the French government and the Russian emperor, who would supply them with troops, money and arms. She was involved in the capture of Seo de Urgel in Catalonia on 21 June 1822, followed by the proclamation of Ferdinand VII as absolute monarch. For this, the Regency rewarded Josefina with the title of Condesa de Sales or Countess de Sales, a distinction later confirmed by King Fernando VII. At the fall of the constitutional regime in 1824, she moved to Barcelona, where she continued plotting ultra-royalist activities. However, while she was in in Barcelona she was far from Cervera, the main focus of the rebellion. When the new absolutist movement was set up in 1826, ‘The Trappist’ died as a prisoner in a convent and she was imprisoned in Barcelona. However, Josefina made good her escape from Barcelona and installed herself in Cervera, where she gathered a new ultra-royalist group, with the support of a large number of priests. When the ‘malcontents’ were defeated and the main leaders were shot and hanged, Josefina was arrested on 18 November 1827 was imprisoned in the Ciudadela or citadel in Barcelona. She was accused of holding meetings in her house that gave rise to the constitution of the Junta de Cervera, as well as having encouraged more than 150 people to arm themselves. She denied all the charges against her but was found guilty. Her death sentence was commuted because she was a woman, and she was sentenced to live an enclosed life in exile in the Convent of Encarnación in Seville. Josefina regained her freedom after the death of Ferdinand VII in 1833, and for the rest of her life she lived a secluded, almost hidden life in the Corral del Conde, a large mansion that still stands on Calle Santiago in Seville. The first semi-biographical accounts of her adventurous life were written during her own life by her political opponents, including Agustín Letamendi (1849) and Francisco J. Orellana (1856). Some of the accounts discredit her by alleging she had an affair with a young gardener in the convent where she was forced to live in Seville. 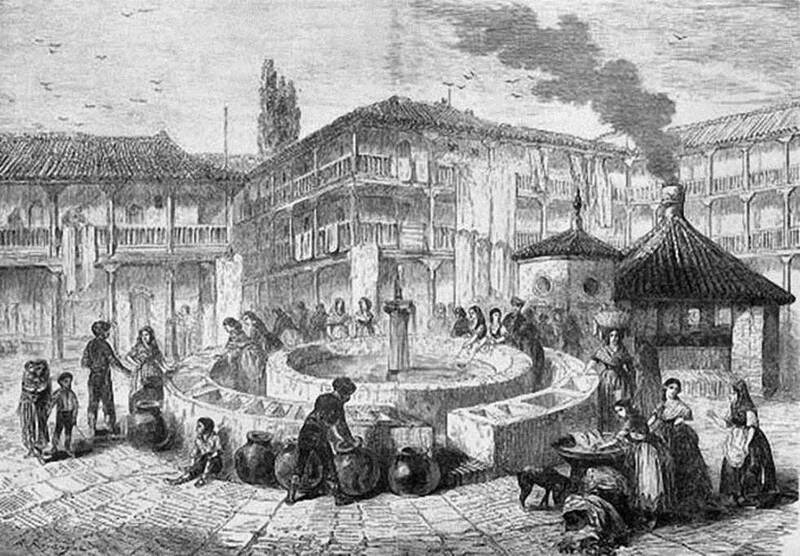 Don Antonio Pirala, the historian of the 19th century civil wars, tried to see her in Seville in 1853 but was told she either was back in Catalonia or had returned to Ireland to settle family affairs and to recover some of her belongings. She died in Seville on the Monday before Easter 151 years ago, on 3 April 1865, and was buried in the Cemetery of San Fernando in grave number 527. 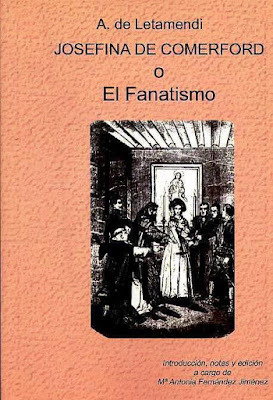 Many of the historical accounts of her life are based on the semi-fictional two-volume book by Agustín de Letamendi, Josefina Comerford o el Fanatismo (Josefina Comerford or Fanaticism), published in Madrid in 1849, or the work of Francisco J. Orellana, the author of El Conde de España o la inquisición militar (The Count of Spain or the military inquisition), published in Madrid in 1856. Letamendi’s book is influential, and many of the authors who wrote about the adventures of this Comerford countess drew on his semi-fictional book for their information, uncritically including its many errors. The details of her family origins and her guerrilla activities were copied from one book to another, reproducing silly details and inaccuracies. Cristóbal de Castro’s novel The English woman and the Trappist (1926) is misleading even in its title describing her as “the English woman.” He rescues Josefina de Comerford as a heroine in his short, 60-page novel, in which she is portrayed as a beautiful and enigmatic woman who was known as “la dama azul. But he makes religious fanaticism the keystone of her life, and he invents the story of her affair with Frasquito, the gardener’s son. He ends with a degraded character who falls into alcoholism after her turbulent relationship held with the young man in the convent garden. In 1948, Federico Suarez Verdeguer cited the treatment received by Josefina Comerford in history as an example of the total absence of political impartiality with which the history of 19th century Spain has been analysed. He compared her treatment with that of Mariana Pineda, who is considered a martyr for freedom because she had the courage to make a flag for liberals. A few years later, in 1955, the ABC newspaper published an article by Pedro Sanchez Nunez entitled ‘Una heroína difamada’ (‘A defamed heroine’). The historical and fictional accounts of her life include: Agustín de Letamendi, Josefina de Comerford o el fanatismo (Madrid, 1849), Betino Pérez Galdós, ‘Episodios Nacionales,’ in El voluntario realista (num 18, Madrid, 1976), Francisco José Orellana, El conde de España (Madrid, 1856), Antonio Pirala, Historia de la guerra civil y de los partidos liberal y carlista (Madrid, 1889-1891), Crisóbal de Castro, La Inglesa y el Trapense (Madrid, 1926), Crisóbal de Castro, La generala carlista (Madrid, 1931), Pío Baroja, Siluetas Románticas (Madrid, 1938).